Racing Drones, which is also called competitive UAV, refers to the unmanned aerial vehicle used for racing competition with fast speed and short endurance. Racing Drones is a featherweight of multi-axis UAV family, generally adopt four-shaft layout. 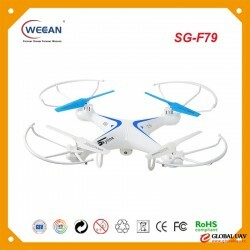 It is small in size within 1 kg weight, which can easily through the complex terrain, finish all kinds of stunt flying movements. They have a front-facing camera that allows to fly in FPV (first-person view), so you will have a more realistic flight experience. In general, a Racing Drones consists of a frame, a motor, a electric adjustment, a flight control, a camera, an image transmission module and other components. A drone pilot should also be equipped with a remote control and a receiver, such as a monitor screen or a pair of FPV glasses. The Racing Drones is hard to control because its speed is generally fast (maximum speed is 200 km/h), and the machine is easy to crashed because of out of control (commonly known as plane explosion), so much of the fuselage is made of carbon fiber, which can reduce weight and ensure the strength of the fuselage simultaneously. In addition, in order to minimize the entry barrier of the Racing Drones, the way to control it has been easier, and now many manufacturers have installed a GPS and a barometer on the machine to detect position and height. The assembly and debugging of the Racing Drones are not complicated, even the newly initiated players can quickly complete the assembly process through self-learning. And there are many sets of products on the market, except the remote control (receiver) and the monitoring screen need to be purchased separately, the components that make up a complete machine are absolutely available. For newcomers, the difficulty to assemble a set of this kind machine is lower (because you don't need to study individual parts matching and installation, etc), moreover, the price also has taken more advantages compared to buy different parts separately.